October 28, 2014 Robert A. Weigand, Ph.D. In this article I will analyze the 10 individual components of The Conference Board’s leading economic indicators as described in Chapter 2 of my new book Applied Equity Analysis and Portfolio Management. The chapter describes how to score each indicator +1, 0, or -1 based on their level and trend, and use the spreadsheets included with the book to average these scores into a diffusion index for each set of Conference Board indicators (Leading, Coincident and Lagging). All the graphs and data series shown below are included in the book. For readers on the fast track, this article will conclude that, despite generally positive readings on most of the official Conference Board indicators, the U.S. is likely to remain in a slow-but-steady expansionary phase for the next 3-9 months, with little chance that economic activity will accelerate further. The 10 leading indicators are depicted in the table below, along with the weights assigned by The Conference Board. 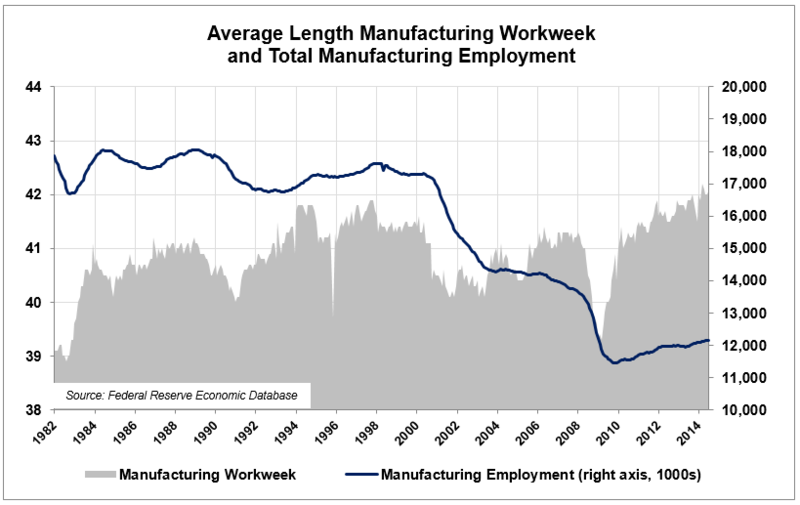 The most heavily-weighted component is the Average Length of the Manufacturing Workweek (weight = 0.2781), shown below with total employment in the manufacturing sector. The length of the workweek is higher than it has been at any time since 1982, which The Conference Board interprets as unequivocally positive. Unfortunately, as also shown in the graph, this longer workweek is being enjoyed by 5 million fewer employees in the U.S. since the start of the 2001 recession. 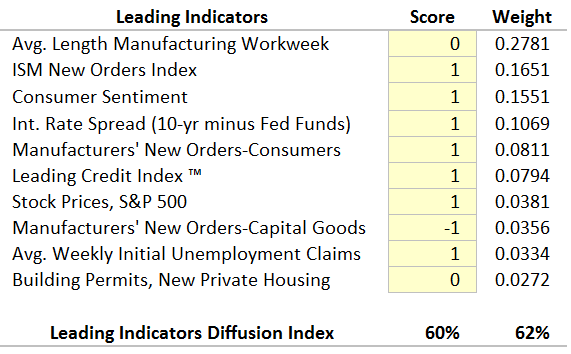 Although the length of the workweek is up, the contraction in manufacturing employment leads me to score this indicator zero, rather than a more optimistic +1. 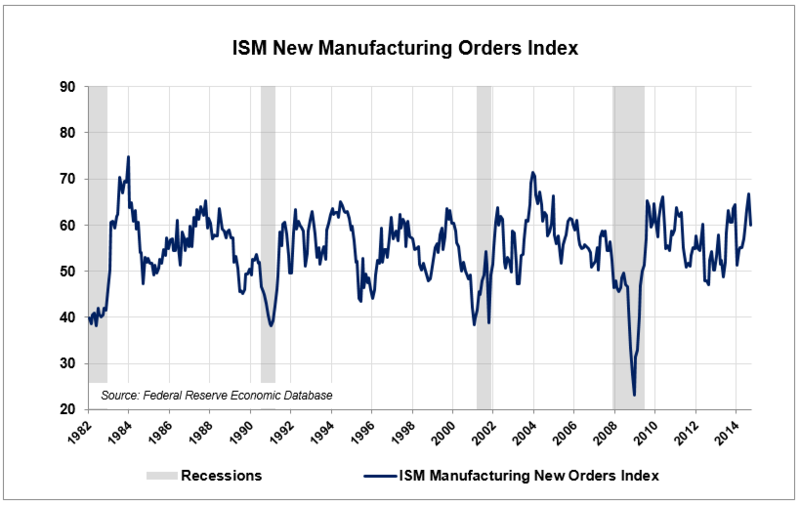 The second leading indicator is the ISM’s New Manufacturing Orders Index (weight = 0.1651). The index has recently reversed its post-recession downtrend from 2010-2012, bouncing strongly off its 2012 low of 50 (suggesting contraction). 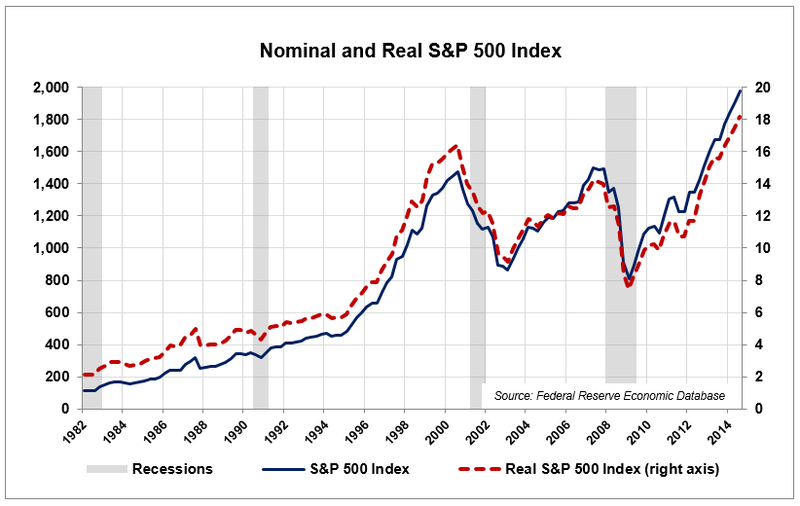 Notice how previous recessions have been preceded by similar downtrends. I will rate this indicator +1. 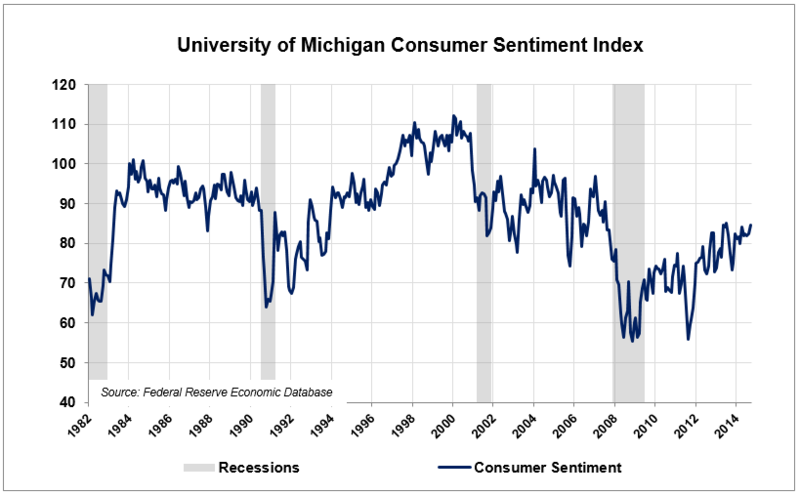 The University of Michigan’s Consumer Sentiment Index (weight = 0.1551) has also been in a slow, steady uptrend, which merits a score of +1. Notice how the indicator collapsed in late summer of 2011 before Bernanke went to Jackson Hole and vowed to leave the QE spigot on full blast for “as long as it takes.” There is a bit of a concern that current survey scores in the mid-80s have been historically associated with recessionary lows in previous business cycles. 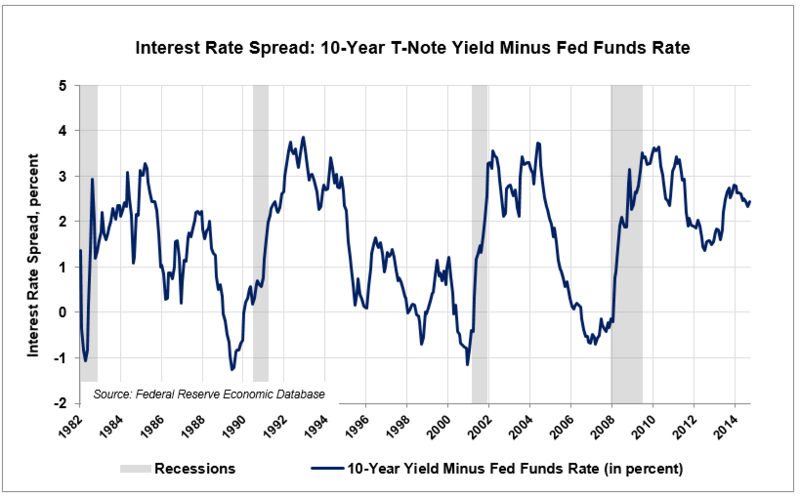 Interest Rate Spread Between the 10-year T-Note and the Fed Funds Rate (weight = 0.1069). This indicator is really a proxy for the slope of the yield curve. A steeply sloped yield curve usually forecasts economic expansion, while a flat or inverted yield curve indicates slowdown or contraction. The curve has recently flattened slightly, despite expectations that the Fed’s QE program is now over (which should have resulted in higher, rather than lower, long-term interest rates). This indicator also merits a score of +1, as the spread remains sufficiently positive. Manufacturers’ New Orders for Consumer Goods (weight = 0.0811). 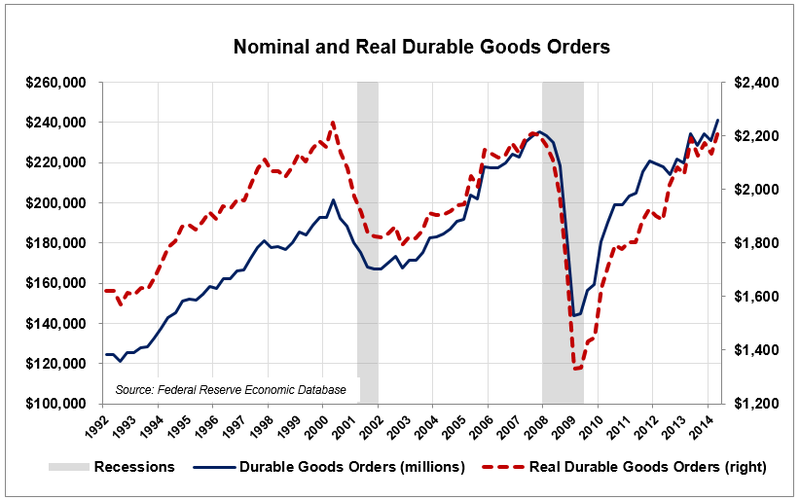 Nominal and real Durable Goods Orders (deflated by the Personal Consumption Expenditure Index, or PCE) are shown below. The indicator rebounds sharply following the last recession, with Durable Goods Orders displaying slow, steady growth back to its level preceding each of the last 2 recessions. The positive signal conveyed by this indicator merits a score of +1. 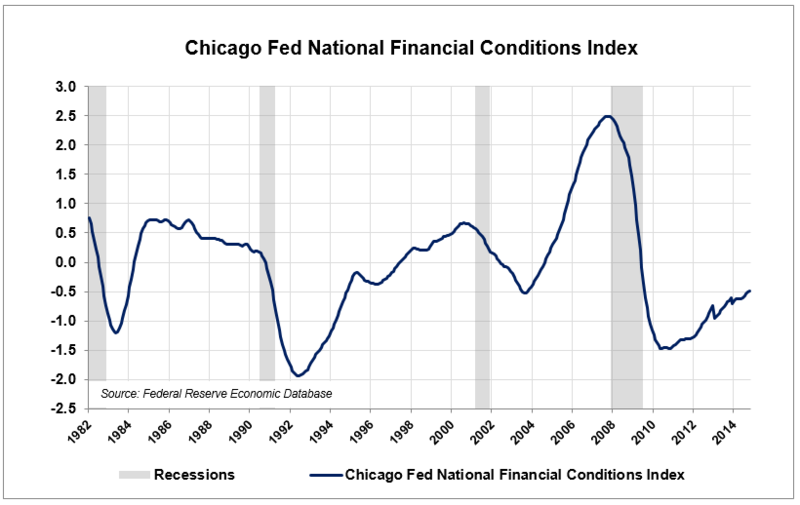 The Chicago Fed’s National Financial Conditions Index will be used as a substitute for The Conference Board’s proprietary Leading Credit Index (only available by subscription, index weight = 0.0794). Lower levels indicate “looser” borrowing conditions. Access to credit remains easy, especially for this stage of an economic expansion, so I’ll rate this indicator +1. Level of the S&P 500 (weight = 0.0381). The S&P 500 has “broken out” of its secular bear phase. As stock prices are supposed to lead economic conditions by 3-9 months, I will rate this indicator a cautious +1, as Sept-Oct volatility is still playing out in markets, and some market pundits still calling for an all-out crash (see John Hussman, for example). Manufacturers’ New Orders for Capital Goods (weight = 0.0356). 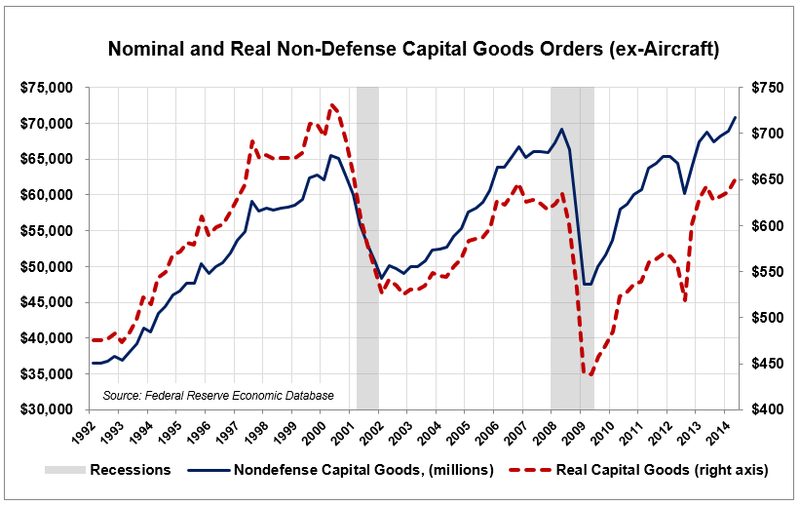 Unlike the pattern observed in Durable Goods, the Real (inflation-adjusted) Capital Goods Orders index has yet to match its level from prior expansions. The trend is up, however, so I’ll rate this indicator zero. The dearth of capital expenditure by U.S. firms, vs. their rabid appetite for share buybacks, remains a concern, however. It’s difficult to reconcile that the economy can be expanding when Capital Expenditures have grown more slowly than the rate of inflation for the past 14 years. Initial Unemployment Claims (weight = 0.0334). 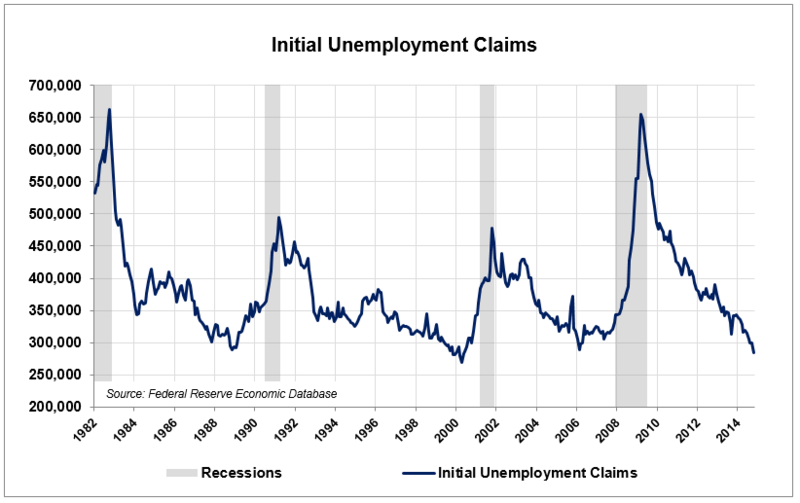 Unemployment claims continue trending lower, and have achieved levels associated with previous economic expansions. This indicator therefore rates a score of +1. 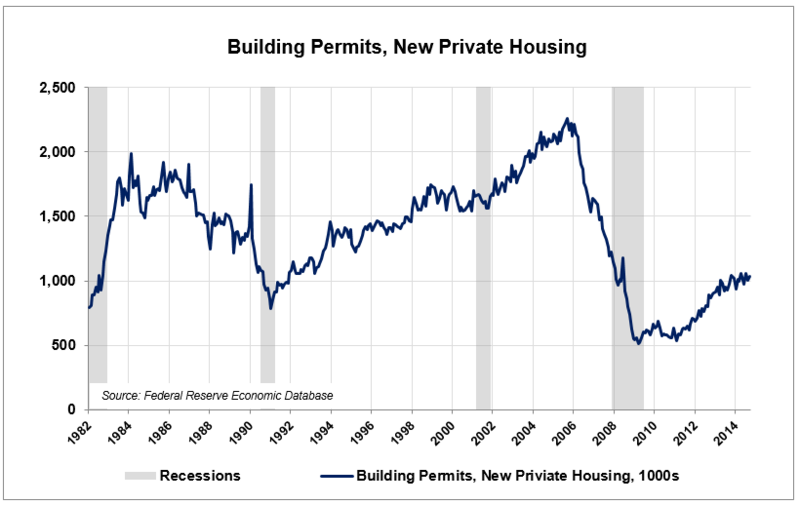 Building Permits for New Private Housing Units (weight = 0.0272). This indicator continues advancing, but only to levels associated with the depths of the 1982 and 1991 recessions. I will therefore rate the indicator zero. 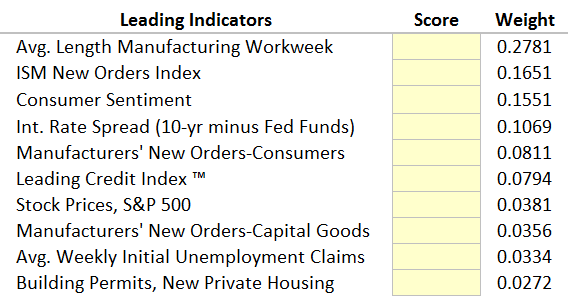 The individual scores for each leading indicator and their weighted and unweighted averages (with possible lows and highs of -100% and +100%, respectively), are shown in the table below. The weighted diffusion index value of +60% is the second strongest score since the most recent economic expansion began, indicating continued acceleration of economic growth through early 2015, and possibly longer. I will complete this post by taking a look at additional indicators that are not officially part of The Conference Board’s series. The prospect of faster future growth was confirmed by a 2013 Q3 GDP growth rate of +4.0% (see below), although subsequent growth has slowed once again. Below is a table taken from The Conference Board’s public website on October 28, 2014. 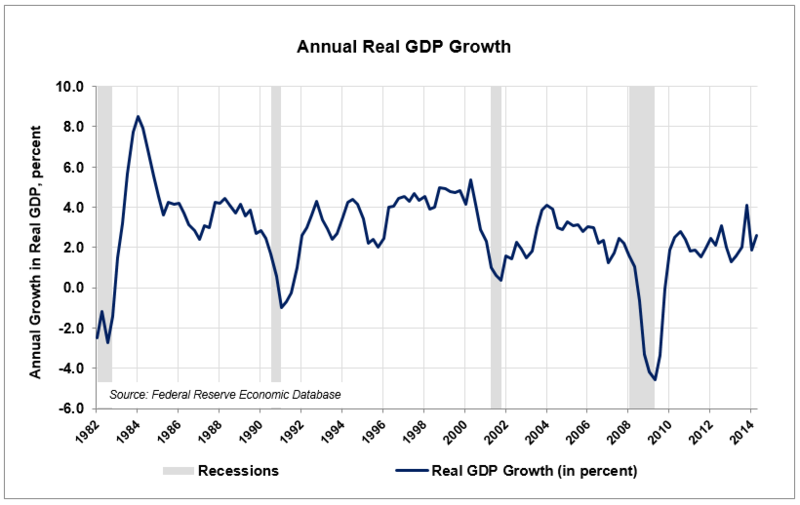 Despite the recent pickup in GDP growth, they are forecasting only 2.1% real growth for all of 2014, and 2.6% for 2015 — too slow to get the job done. 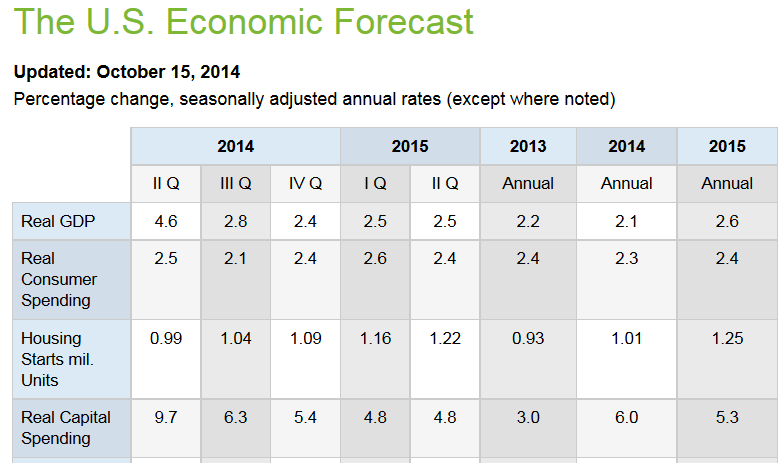 Similarly, the sluggish rate of consumer spending is expected to continue through 2015. Perhaps most fantastical is the prediction of stronger growth in CAPEX spending for 2014 — despite today’s report by Bloomberg that both durable goods and capital goods orders have been contracting in recent months. 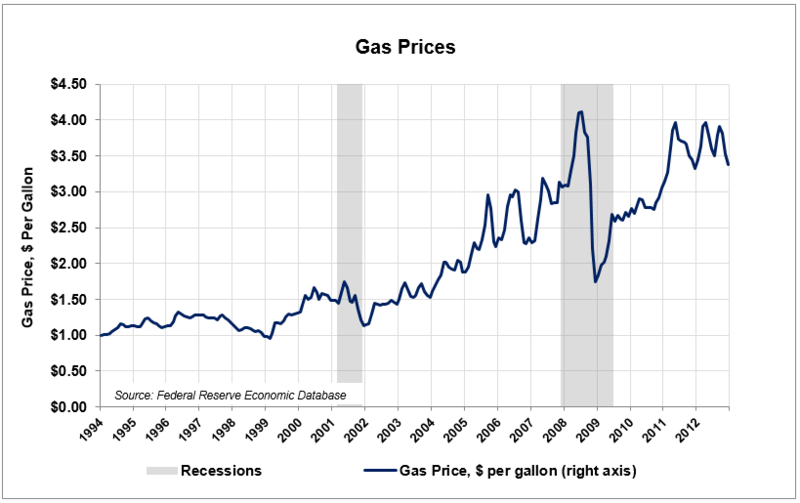 Gas Prices. Continuing with a quick look at other “unofficial” indicators, gas prices have eased off a bit thanks to the decline in oil prices, which should put a spring in the step of the U.S. consumer, especially heading into the holiday retail season. Unemployment and Underemployment. 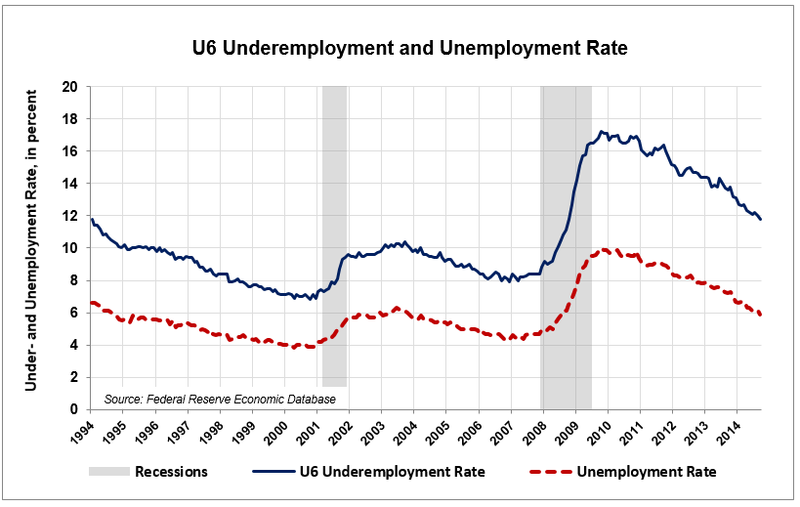 Although an unemployment rate of 5.9% is a beautiful thing to behold, the U6 underemployment rate is the highest its been in 20 years — and that’s after 5 straight years of declining! Financial Profits and Household Debt. 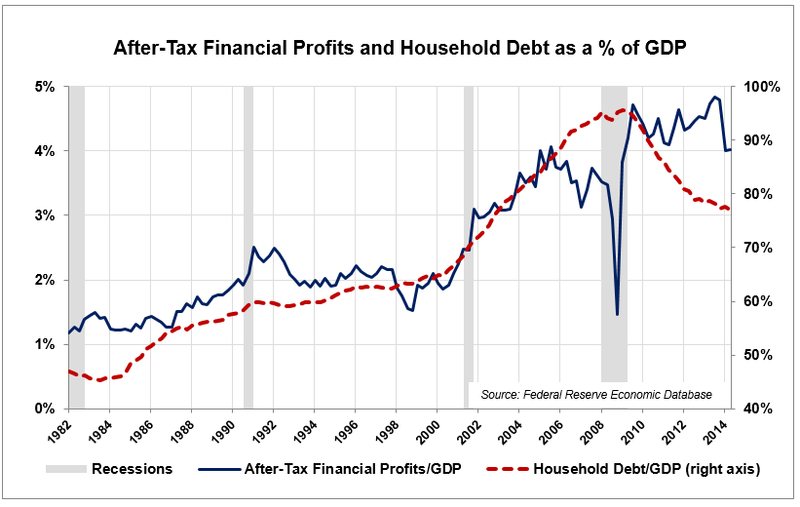 Other trends that concern me include the record levels of financial profits as a percentage of GDP, and the continued high level of household debt, despite 5 years of modest deleveraging. An overleveraged consumer is likely to be a cautious consumer. 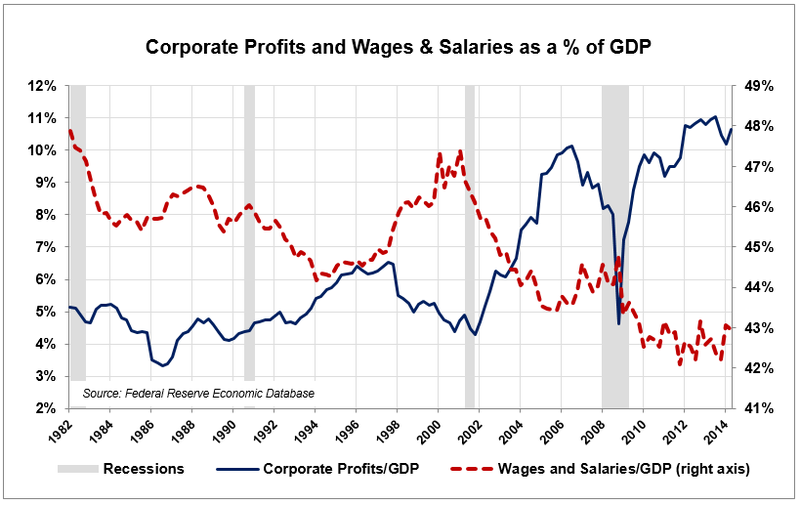 Corporate Profits and Wages & Salaries. I am also concerned when corporate profits increase at the expense of wages and salaries, as an underpaid employee is also likely to be a cautious consumer. Nonfarm Payrolls vs. New Hires. 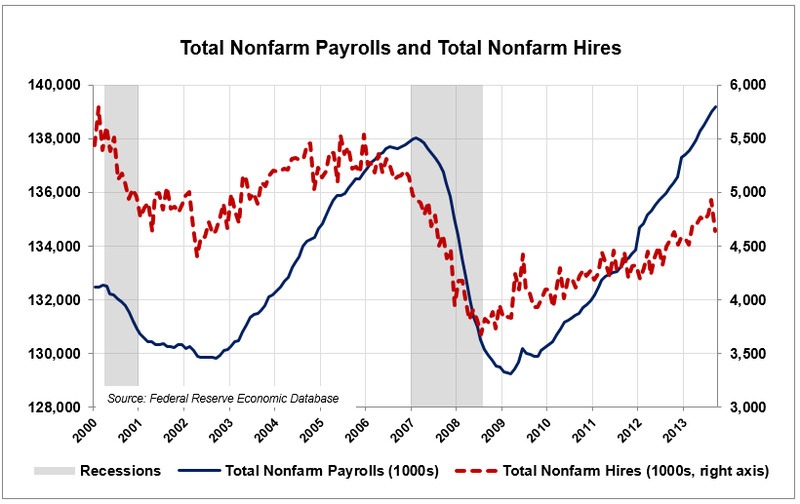 Finally, notice the divergence between the rate at which Nonfarm Payrolls increase, vs. the more tepid pace of New Hires. The explanation? A timid, underpaid employee facing a national underemployment rate of 12% is less likely to leave a job they dislike to seek better employment opportunities. The increase in Nonfarm Payrolls is therefore due as much to a lower rate of voluntary termination as it is due to actual job creation. Conclusion: The U.S. remains in an economic expansion, with no real indication of a pronounced slowdown on the horizon. Unfortunately, there is little indication that economic conditions will accelerate, either. Given Japan’s return to recession and Europe’s pronounced slowdown (and shaky bank stress tests), the U.S. will probably remain in this slow but steady expansionary phase for another 3-9 months.